1880, elm and pear wood, brass fittings, from Cheon Ra Nam Do Province. 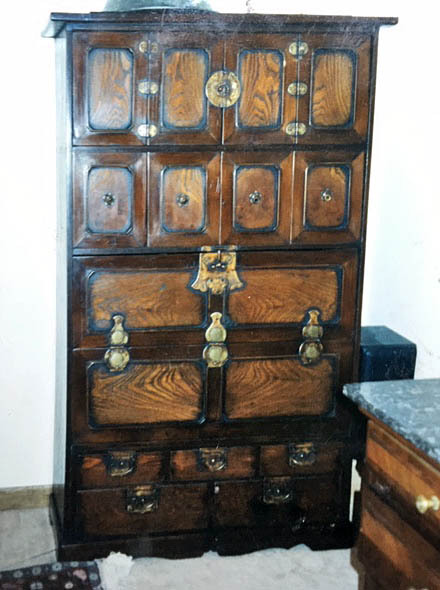 This arresting tall chest has the frame made of pear wood, and the front panels of elm, making used of the grain of the elm as decoration. 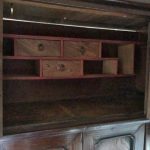 It is made up of several tiers with multi panels and doors opening in different ways, and two rows of drawers located at the bottom. 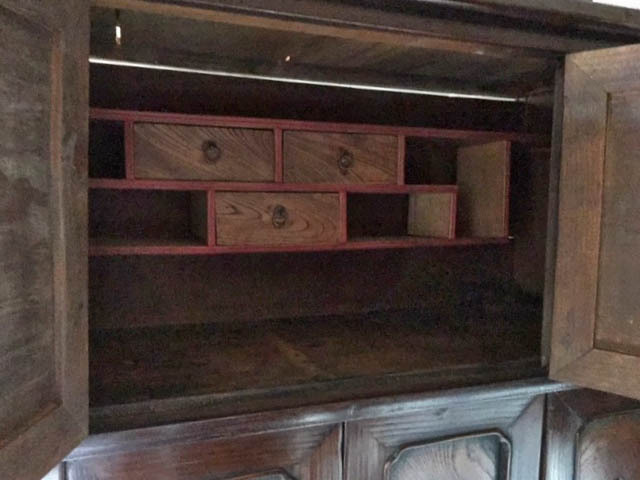 The top tier has a pair of doors opening in the middle to reveal two shelves with two small drawers mounted on the top shelf and one in the middle of the next shelf. The second tier has four panels sliding sideways when one panel is lifted off a track. The third tier opens downward as a half door, resting on the fourth tier, then the two tier of panels can be completely lifted off. This is a very unique arrangement found in a Korean cabinet. The brass hardware is different on each level and each lock-plate and the hinges display beautiful motifs. This is a handsome chest for any room, traditional or contemporary. It is in very good condition.